Thanks, Teri! Glad you like it! Thank you, Fabio, you’re so kind! He was really a challenge. I still don’t see him there, but he was really fun to try. He has a great face! Now that I see his entire face I may have to change my guess! Still fantastic job Laura. Susan, your first guess was right! I’m holding it in moderation so no one else will see it until later today, but bravo! I’m so glad you saw him there! Thank you! It was all in the eyes Laura! So bravo to you. PS – But now you see why I didn’t post this sketch initially. I thought the partial looked more like him than this full face I tried first. The only thing that threw me off is I think his face is rounder. Plumper face the best way for me to put it. Not to be insulting. 🙂 But still you did a great portrait of him. Not insulting at all! I agree with you totally. The shape of his face was definitely off. I love constructive criticism, it’s really helpful! 🙂 you did such a good job I guessed who it was. It’s not who I was thinking of. Now I think it’s Sir Anthony Hopkins a.k.a. Hannibal Lector. Great sketch! They are both great drawings but I can’t see who it is… frustrating! Thank you so much for your comment! I can’t see him either lol! A couple people have actually seen him though, which really surprises me! So glad you liked the drawing! What a marvelous rendering of this man’s face – you have really captured him with excellent detail. Thanks so much! I’m so glad you enjoyed it! His face was a real challenge. Thanks! 😀 So glad you like it! You got it, Ann! Well done! Now that I see the full face, I have no idea who this is, great job on the sketch. Totally understandable, I’m pretty sure I wouldn’t know him either. Glad you enjoyed the sketch! I think you’d recognize a photo of him tho, but maybe not. I’ll let you know tonight who it is. Oh ok. He was in Silence of the Lambs I believe in the 80s or early 90s? Was probably his biggest film that I know of. What a creative journey you are on.. Well done Laura! Thanks, Jennifer! Is that what they’re calling it? Lol seems like a creative obsession! :))) So glad you’re enjoying! Thanks for stopping by! You are welcome Laura.. Not sure why I mentioned creative journey but it was the first thing that came to mind! I think it’s a great way to think about it, I’m just teasing you lol. I’m face obsessed! It’s fun. Yes! That is what creating art is all about, having fun! Thanks, Iris! Glad you enjoyed it! I’m sure enjoying these faces. Having a blast! Very nicely done, is it Anthony Hopkins? OMG! I so know this face, but can’t think of name! ARGH! Trying to hard and hurting my brain. LOL! I’m so glad you like it Jodi! :)))). You are hilarious! GRR!!! OF COURSE it is Anthony Hopkins! I knew that! LOL! DANG! I knew that! Just couldn’t think of his name! You know….. I knew I knew him. hahahahaha! Awesome Laura! Sorry I missed it today! I’m not 100% anymore. Broke the streak – the pressure is off PHEW! You’re not alone, C! It’s Anthony Hopkins. Very challenging face. I won’t be doing wrinkles, weird noses or odd bottom lips for some time lol. Thanks, Teresa! I’m so glad to hear it! He was a challenging one. I could not tell that you had any trouble with it! Thanks, Debi! Wait, did I miss your guess?! Maybe WP took its mighty phaser gun to it?! Glad you enjoyed the sketch! Thank you, Charlie! This is the original sketch I did and I started over completely, liked the eyes better, so posted that partial. I think I’m ready to put wrinkled faces away for awhile lol. It was fun though but definitely a challenge. This would have been a hard guess for me simply for the fact that he can and has changed his looks so drastically and has worked for so many years. You did a fantastic job! Thanks! I noticed that in reviewing photos of him – it’s almost like he’s a chameleon! And as you say, he’s been in the business a long time. Really appreciate your encouragement, Suzink! You are welcome! Call me Suz, everyone else does. Thank you so much, Jenny! I really enjoy your work too, and looking forward to seeing more of it. I couldn’t draw just over a year ago. I’ve just been diligently practicing is all. Well, and reading about it, watching YouTube, etc. I think it was last June that I committed to drawing something every day and that’s made a huge difference. Even 10 minutes. I’d like to improve my mixed media work also and hoping to learn from you! Thanks for visiting and commenting. I really appreciate it! I really appreciate that! Thank you! Learning to draw is mostly learning to see. And finding a subject that really stokes you is also key, I think. I started with eyes and partial faces last January and now I’ve come full circle. I still love eyes best. Find what you love and run after it as hard as you can. I’m looking forward to watching you fly! Whatever I can do for you, name it! 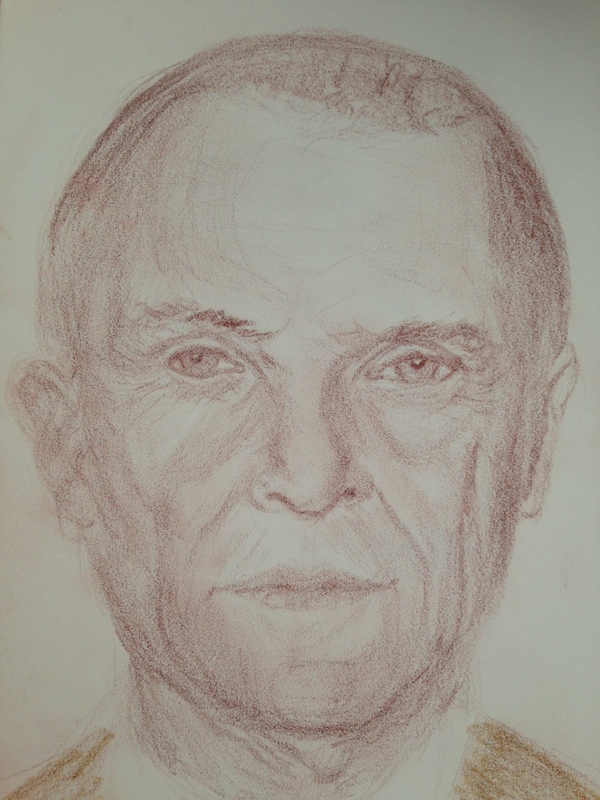 Another fabulous portrait drawing Laura – is it Anthony? Your work on faces is remarkable with a noted certainty in values, form and character. Thanks so much, Mary. Yes it is Anthony Hopkins, he of the challenging face! I have many YouTube videos from Alphonso Dunn of drawing the portrait in ink to thank for any improvement you see in my portraits from last year. Well and practice. Can’t discount that! I’m so glad you enjoy my portrait work. Makes me feel I may be on the right track. May switch gears for a bit to pets, which is really am enjoying too. Some nice gradations in tone, Laura. Well done. Thanks so much, Graham. Your encouragement means a lot!